Two full days in the Italian Dolomites. 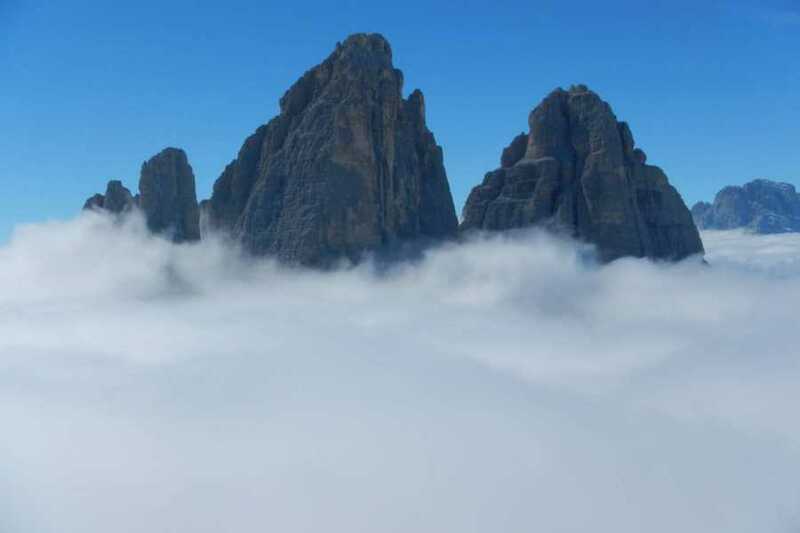 Three Tops of Lavaredo, and “Cima Grande” in all its glory ( The Grand Top), regal symbol of Dolomites, is without a shred of doubt one of the most famous climbing spot anywhere in the World. Everything about this climbing adventure is extraordinary. First open to the public by Grohmann, Innerkofler and Salcher in 1869, this is a true journey into the heart of the mountain. By following its gentle curves you will surely leave your personal mark on this unforgettable journey. Note that at least 3h are required to climb up, and 3h to come down, clearly not a walk in the park. It will be a long and tough day, meant only for the bravest. The max difficulty grade 4 (UIAA) , but constant high levels of concentrations and climbing experience are required, which put this climbing (path) into a category of its own, even though 150 years have passed since being climbed for the first time. Cima Grande di Lavaredo is reserved for experienced climber who would like to add one of the most beautiful mountaintops in the world to their bucket list. It takes two days to reach the peak, where first day is the rehearsal for the day after, going over climbing techniques, and descend by double rope. Given the hidden difficulties en route, physicality and concentration required, preparation the day before is an absolute must. Chosen Itinerary will be at Guide’s discretion, based on each participant’s technical abelites. Guide can at any time change, modify and/or stop the activity due to the lack of minimal safety measures. Difficulty: grade 4. Rather demanding as it requires high levels of concentration and extra time. Clothing and equipment: Technical alpine clothing, wind/waterproof jacket, walking boots, imbracatura bassa, climbing helmet and shoes, packs with energy snacks and drinks and a torch. Travelsport may provide all required technical equipment. Excluded Services: Overnight stay, pick up and drop off, to and from lifts, road toll towards Tre Cime di Lavaredo (to be shared by participants). Unless specified otherwise in the Included services above, all other services are duly excluded. Number of participants: Maximun of 2 for guide. Changes or Cancellations due to adverse weather conditions: A new programme date will be agreed. If the new date cannot be set, the booking will be refunded in full.